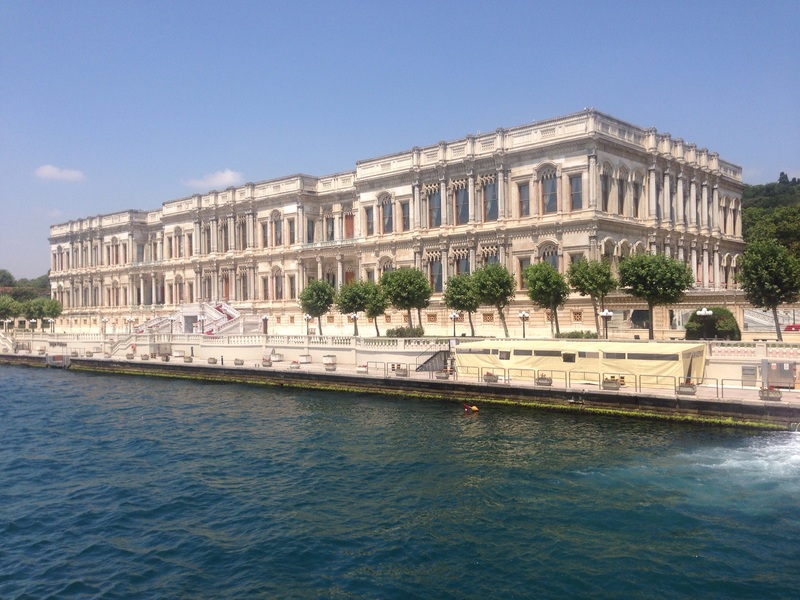 One of the Three imperial Palaces in Istanbul. Magnificent. Today was another hot day so we decided to take a river cruise along the Bosphorus which gave a great view of the Old City (Eastern culture) and the New City (Western culture). The cruise took around 3hrs and after we found one of the vast numbers of cafe’s to have a bite to eat and a coffee. We then made our way to Taksim Square which is considered to be the heart of the modern city of Istanbul. The term “modern city” in reality means there is Pizza Hut, H&M, Burger King etc. The afternoon we all crashed out back at the apartment we were staying at following all the walking and the heat of the day. 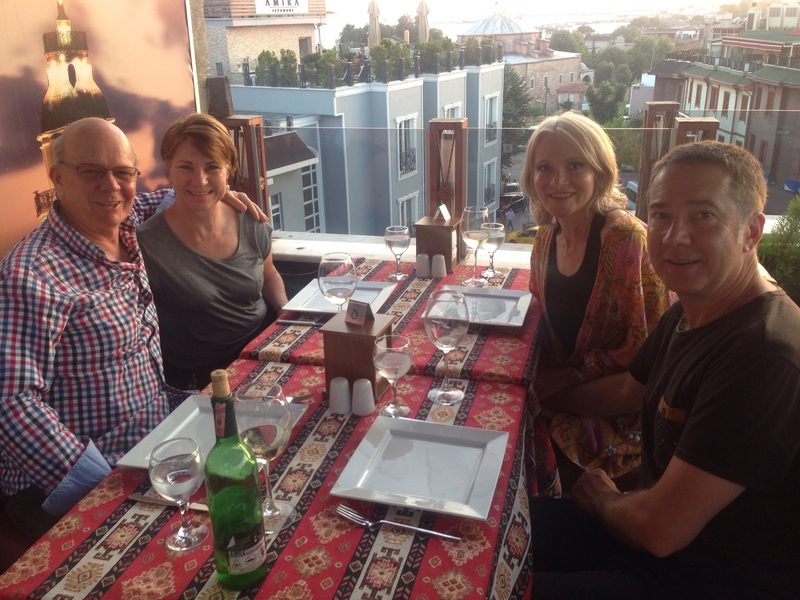 The evening was yet another opportunity to experience the food of Istanbul. If ever you get the opportunity to visit this famous city you will certainly enjoy the variety of food there is on offer. You won’t be disappointed. 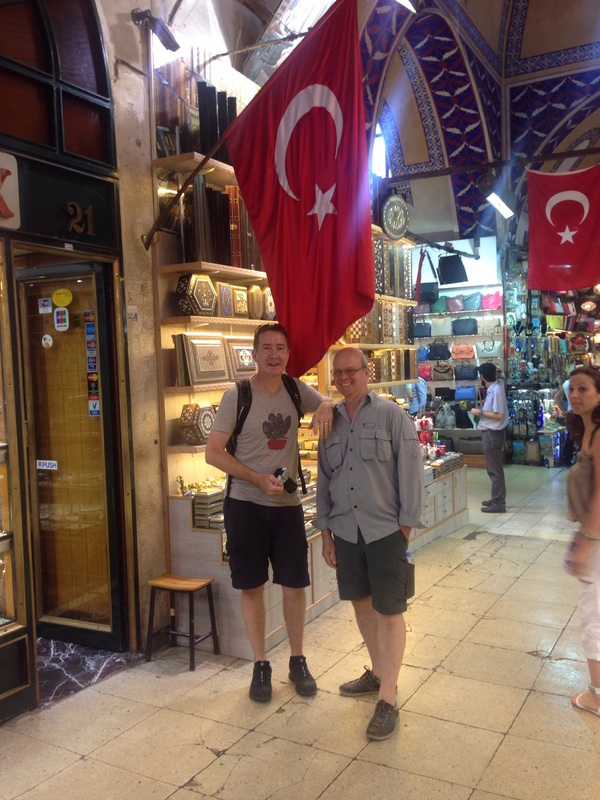 Steve & David under the Turkish Flag in the Grand Bazaar. The view of the Blue Mosque from our street. Fantastic! Istanbul is a very interesting city, with 24m residents every millimetre is utilised and there is always someone waiting to sell you something should you stop in the street to take breath for too long. We have also arrived during the Muslim religious period of Ramadan which is the 9th month of the Islamic calendar and involves fasting during daylight hours. Fasting is one of the five pillars of Islam and is observed by Muslims world wide to commemorate the first revelation of the Quran. Another facinating aspect to this city is the “Call to Prayer” that occurs 5 times a day and is broadcast “loudly” from every mosque across the county , starting at around day break and the final call occurring around 10:30pm each night. 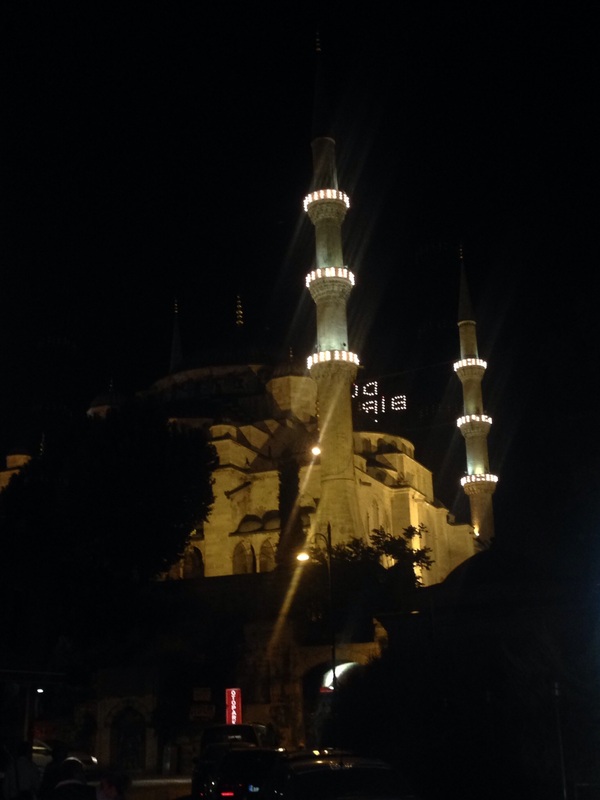 The Arabic chants are extremely captivating as you hear the sound originating from such a holly place as the Blue Mosque. 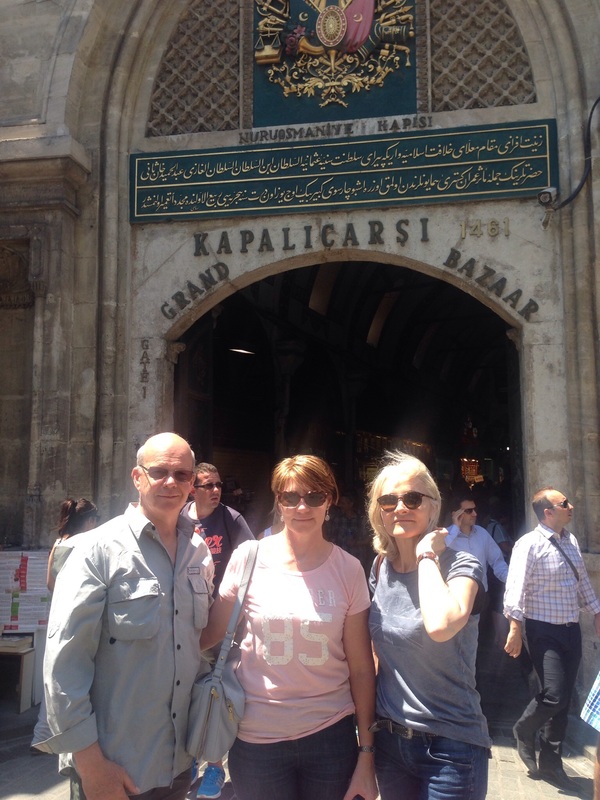 Today was primarily take up by walking the streets and exploring the Grand Bazaar which I must say appears to be totally geared for tourists now which is a bit disappointing but to be expected. 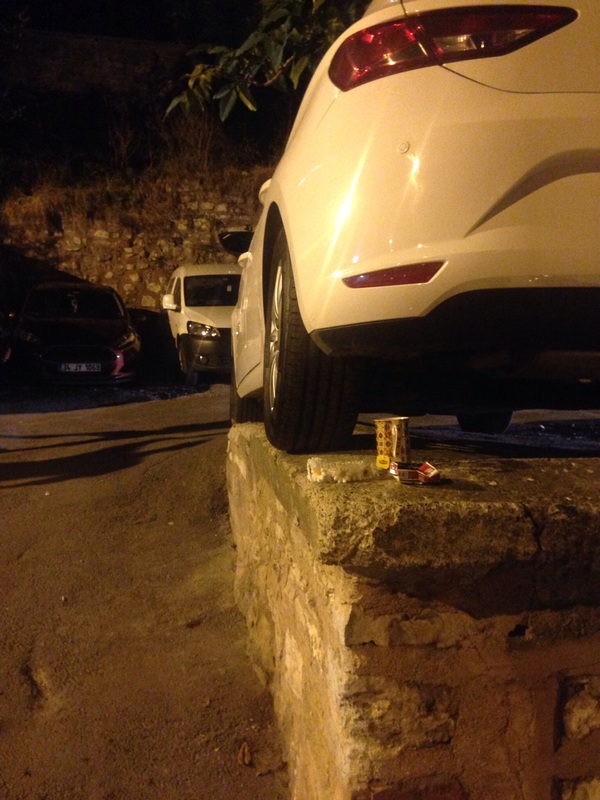 Every inch is used in this manic City. The subtle entry to the Massive Grand Bazaar! Great to be together in a wonderful setting. Today was a day that came with great excitement as both Jo and Kathy (David’s wife) were arriving to meet us. After yesterday’s ride it the icing on the cake! Both Steve and I slept like babies following yesterday’s adventure. Once we awoke and sat at the local cafe sipping on Turkish coffee (great flavour). We had time to have a chuckle at the ride which also included riding up footpaths and doing manoeuvres that would have us in front of a judge in Australia but in Istanbul were the norm. the girls arrived at 6:30pm to find Steve and I sitting at a cafe quietly sipping on a beer. Of corse we rushed to assist with their baggage and arranged wine to celebrate. 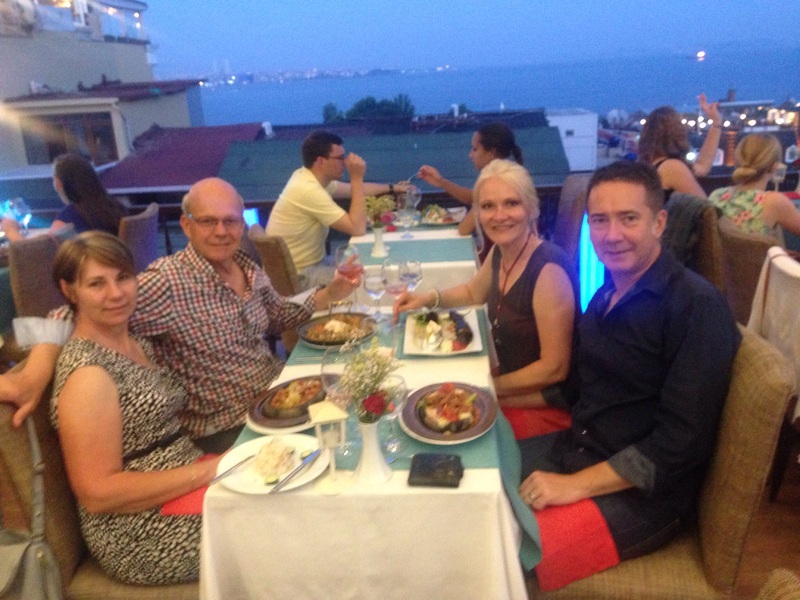 We now have until Saturday 11th before we must move on, but for now Istanbul is to be explored. 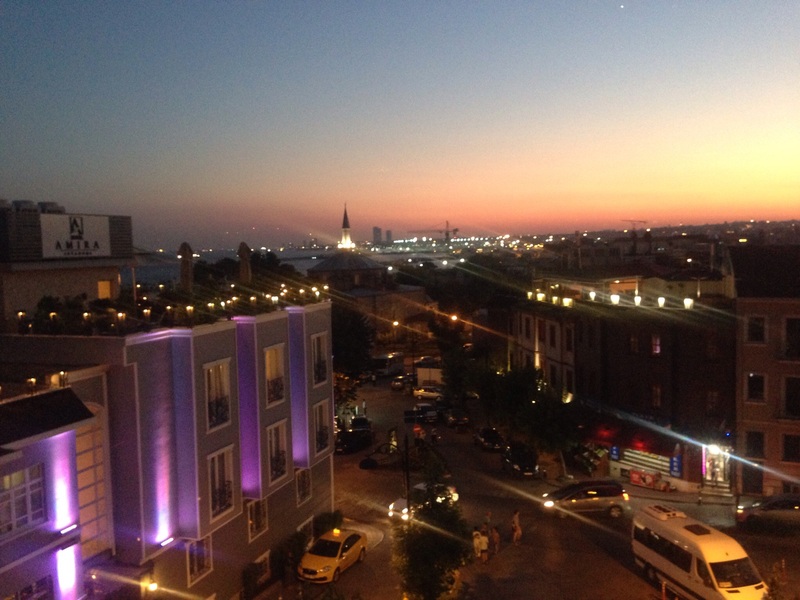 We finished the evening with a fine dinner on a roof top restaurant overlooking the the “Old City”. Waiting on the Turkish side of the boarder. Today we travelled from Serbia, through Bulgaria and onto our destination of Istanbul, Turkey! We left Nis after a sound sleep from yesterday’s big ride knowing that today was going to be an even bigger day on the bikes. It turned out bigger than even we had expected however. Temperatures were in the mid 30’s and with wearing full bike gear we really need to ensure we take in sufficient water throughout the day. After a chat and a scratching our heads several times we got back on route and headed in the correct direction. A big part of the issues we had with navigating Bulgaria was due to the lack of signage and significant road infrastructure project that is occurring at present causing many diversions. The ride proceeded well until we hit the Turkish boarder at approx 7:00pm with temps still hovering around 34deg C. Steve made his way cleanly through the first check point, however I was randomly selected for and inspection. Next thing I had all my luggage stripped out and spread over several tables and the bike being X-rayed. Re packing the bike after a good poke around by the boarder guards and we were off to the the check point only to have me make it through and into Turkey and Steve this time held back due to a problem with computers? We were separated, with me (David) inside Turkey and Steve still in no man’s land sorting out the issue. I was very releaved to see Steve re appear and make his way through the check point. 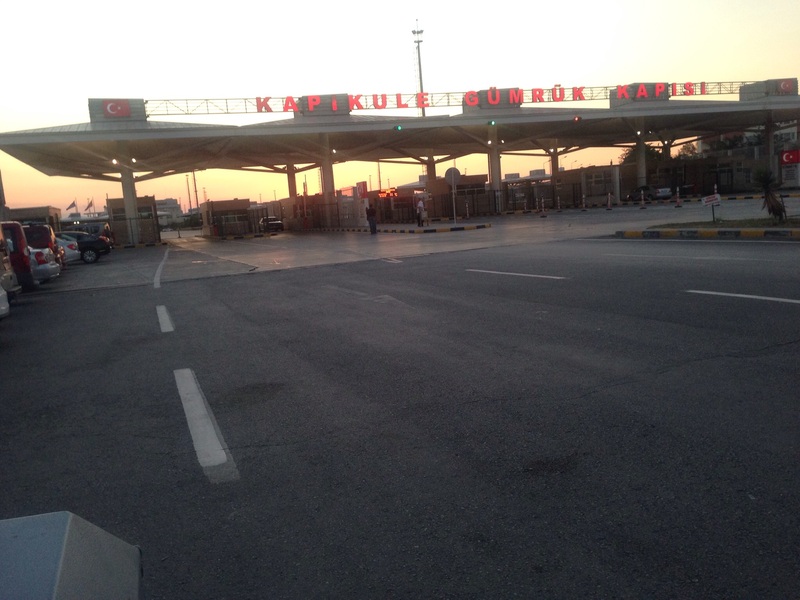 We were finally in Turkey, however by now it was 9:00pm. We were approx 5hrs behind at this point due to the two issues today and with a 3hr dash into Istanbul still ahead we were in for a long one. The roads in Turkey were fantastic however the closer we got nearer Istanbul the driving became more manic. The last stage of navigating to our final accomodation took about 1hr for the last kilometre with us arriving shattered at 01:30am and having ridden 780km’s. This was clearly our biggest day yet.